Late last year, Gone Girl took me so thoroughly by surprise that I knew I had to read more of Gillian Flynn’s books. So I turned to her first, Sharp Objects. Like her more recent novel, Flynn’s debut is dark, twisted, and subversive. She goes for the big shocks, the daring revelations, and she never pulls a punch—instead, she punches harder. With Gone Girl, that daring brought a novel that takes a supposedly happy marriage and reveals the secrets in both partners’ psyches that make a proper happiness impossible. In Sharp Objects, she cuts deeply into family life, exposing how the blood ties that bring life can also bring intolerable pain and death that seeps out beyond the family home. Camille Parker, the novel’s central character, is a Chicago reporter who is assigned a story about a possible serial killer in her hometown of North Carthage, Missouri. Her editor hopes that the hometown connection will give her an inside scoop and save the paper a few bucks because she can stay with her family. Camille, however, wants nothing to do with her family or her hometown, but she reluctantly agrees to take the assignment. The crimes, a child murder and an abduction and presumed murder, seem like drama enough for a crime novel. But Flynn spends just as much time on Camille’s family, gradually revealing the ways Camille’s home was a house of horrors that was lethal to the soul. Camille herself literally carries scars all over her body from years of etching words into her skin as a way of communicating and experiencing her pain. Her 13-year-old sister, Amma, seems locked in a state of babyish dependence when at home but becomes a reckless bully when among friends. And the memory of their dead middle sister, Marian, haunts the whole family. 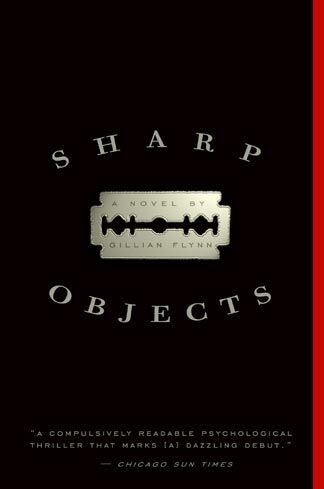 I read Sharp Objects in two sittings, even as I shook my head at its implausibilities. All the while, I hoped that some of the unbelievable behavior would have an explanation, and much of it did. Much of it also points the way to the story’s conclusion. However, parts of the story didn’t sit right with me. For example, Amma’s almost complete transformations went too far in both directions—from obsessing over an elaborate dollhouse in one moment to successfully pressuring her adult sister to take ecstasy in the next. Being 13 can mean going from pigtails to perfume and back again, but the extreme here seemed too extreme. Flynn seems to specialize in extremes, both here and in Gone Girl. And that’s part of what makes her books great. But what Gone Girl had and this book lacks is a tight sense of discipline surrounding those extremes. Here, the ante kept getting higher and higher to the point that realism was left behind. In Gone Girl, the main characters put on a veneer of respectability that required discipline to convey. Camille’s parents have attempted to do the same, but Flynn focuses so much on the dysfunction that we rarely glimpse the normal veneer. I liked this book, but I never quite believed it. This entry was posted in Contemporary, Fiction, Mysteries/Crime. Bookmark the permalink. ahhh I just read this book last weekend! I liked it a lot, but it’s funny like i didn’t even consider the issues you had with it, I was too enthralled by how interesting and dark these women were. I do feel like some stuff was more obvious to me than in her other two books, like I guessed some things before they became clear. But even so, I liked it and the ending paragraph was pitch perfect, imo! Anyway have you read Dark Places? That one is my favorite as it turns out. I was interested all the way through, but a few things niggled at me. I mostly chalk it up to it being her first novel. I agree, too, that some of the plot was more obvious than in Gone Girl (although I figured out the twist in Gone Girl too, and I’m not usually great at that). I haven’t read Dark Places yet, but I intend to. I do like her writing. I just picked up a used copy of this the other week and can’t wait to read it (I’ll definitely be looking out for the last paragraph, too!). I read Dark Places right after reading Gone Girl and really enjoyed it, though it was a vastly different story. I wish I still had the copy I got from the library so I could look up the last paragraph! I can’t remember what it said, and Amy’s got me curious now. Someone sent me a copy of ‘Sharp Objects’ when it first came out and I had very much the same reaction to it as you did. I didn’t therefore bother with her second book and was amazed when there was so much comment about ‘Gone Girl’. I agree that that is a much tighter book and it’s always gratifying to see a writer making that kind of progress. I’ve been debating whether to go back and read the second novel. Have you given that any thought? I do want to read her second book. I liked this enough that I’d be willing to give it a try even if I hadn’t read Gone Girl, but it does help to know that her talent has grown since this first book. I recently read Gone Girl after all the hype, but I didn’t really care for it for some of the same reasons you point to here with this novel. I couldn’t help but think that Patricia Highsmith had done the same plot but so much better (eg, in A Suspension of Mercy), and I can only imagine I’d feel the same about this one. Highsmith novels are so tight and so natural, so focused on the realism and “normal” life that gets sucked into evil, that I can’t help but compare all thriller type books to hers (and the pretty much all lose). I’m the same way about Ruth Rendell/Barbara Vine. You give me a psychological thriller, and I’ll compare it to Rendell/Vine, and most lose in comparison. Flynn is among the few I’ve encountered who comes close to getting it right. (And I still do prefer Rendell/Vine.) I’ve only read a handful of Patricia Highsmith’s novels, but they’re right up there, too. Gone Girl was also a parallel satire on our current economic situation and the attitudes of people about the same – recall that the big disastrous closing in town was the mall, and further down river the tourist trap of Carthage. I suspect that this novel also has a dual focus, one obvious and up front, and another in the background. You may very well be right. There’s a lot in this book about the stories people tell about themselves and others and the way those stories affect reality, often becoming self-fulfilling prophesies that reverberate through the generations. The wide swings in Amma’s character could come from the widely varying visions of who she is.